Saturday afternoon we went to Robert and Shelly's house in Cleburne. They were working on their house because a pipe broked and wet their house. They were staying in a motel while the insurance is fixing their house. George and I spent Saturday night in their motel in Cleburne. We were supposed to go to Traders' Village in Grand Prairie Saturday afternoon but Shelly had to work until 3:00 PM so hubby decided that we will just go next time. Shelly is working now at Wal Mart, hubby's favorite store. Robert and Shelly treated us for supper Saturday night. So five of us went to eat out, Robert, Shelly, Josh, hubby and me. They wanted to take us to Montana Grill in Grandbury because they have a huge chicken fried steak there but that restaurant was full of people. Chicken fried steak is hubby's favorite. 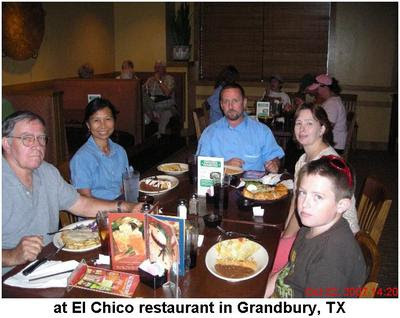 We ended up eating in El Chico, a mexican restaurant in Grandbury. I ordered Poblano Chimichanga with Mexican rice and beans. It was good and yummy. Hubby ordered his favorite chicken fried steak of course. Well, after the main course, I was already full. No more room for dessert. Hubby ordered apple pie, Josh got cheesecake and Robert and Shelly got chocolate cake. I just tasted hubby's apple pie, it's too sweet for me. Hubby said it's good and he like it. After the meal, we were all so full, thanks to the Brownlees. We headed to Wal Mart and walked it off.